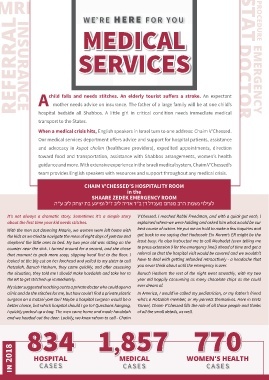 When a medical crisis hits, English speakers in Israel turn to one address: Chaim V’Chessed. team provides English speakers with resources and support throughout any medical crisis. Hatzolah. Baruch Hashem, they came quickly, and after assessing   you never think about until the emergency is over. My sister suggested reaching out to a private doctor who could open a   ever dream of. I quickly packed up a bag. The men came home and made havdalah   of all the small details, as well.